Our July Leading Lady Caren Bartholomew is back for her triumphant third performance! If you missed her smashing debut you must see it...CLICK HERE or how she shook it up during her sensational second performance CLICK HERE. You will not be able to resist her cards today ;-)! Hi everyone! Welcome back to week 3 of my Leading Lady reign at Winnie and Walter. Thank you for all the wonderful comments on my first two posts. For week three, I used the emboss resist technique to create cards using the great Winnie and Walter products. This technique is designed to leave the stamped image white while adding color to the background. The stamped image will “resist” the ink (thus the name). For my first card, I stamped the cascading hearts from the stamp set Scenery: Seeing Hearts in embossing ink, covered it in white embossing powder, and heat set it. I think inked up that panel using 3 shades of pink Distress ink. As you can see the hearts "resisted" the ink. I did the same thing with the You So Much sentiment from In a Word: Love stamp set. I thought the panel need a little more pizzazz, so I used on of the dies from Georgette Borders to add some detail to the bottom of the panel. I used the Love die from In a Word: Love Coordinating Cutaways (have I mentioned I adore this die!) I die cut it three times and layered them together. The top layer is in silver glitter paper. I adhered them to the card base to finish the card. For the second card, I embossed the sentiment on a scalloped circle, then layered three shades of distress ink on it. The back panel uses the same three shades of ink with a stencil. I water colored the bunny using distress inks and fussy cut it out and layered all the pieces onto a gray card base. 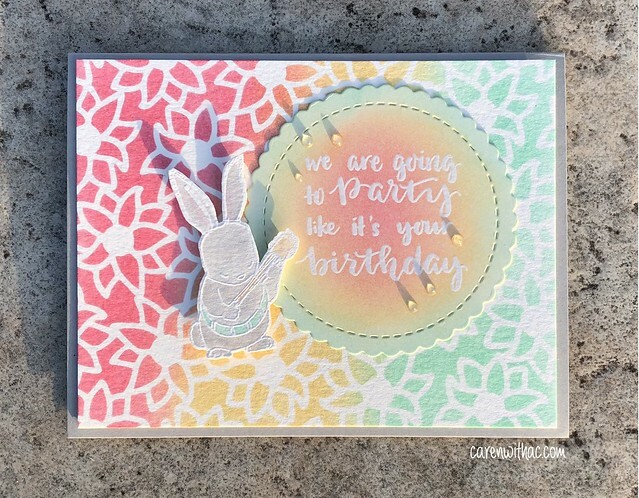 The sentiment and bunny are from the Party On with Evelin T Designs stamp set. I added a few clear Nuvo drops to finish the card. Thanks again for the love last week, join me next week for the big finally and a chance to win a $30 gift card from Winnie and Walter on my blog. Love both of these cards... the colors are wonderful and I love love love the style. Love this resist technique! Pretty cards! Love the pretty embossed hearts and the other one is so colorful, both are so beautiful! Pretty colors and emboss resist is one of my favorite techniques. Thank you Sue, one of my favorites too. Two great cards, especially like the colors used on the LOVE card. Love those stamped hearts. 2 wonderful cards using one of my all-time favorite techniques! 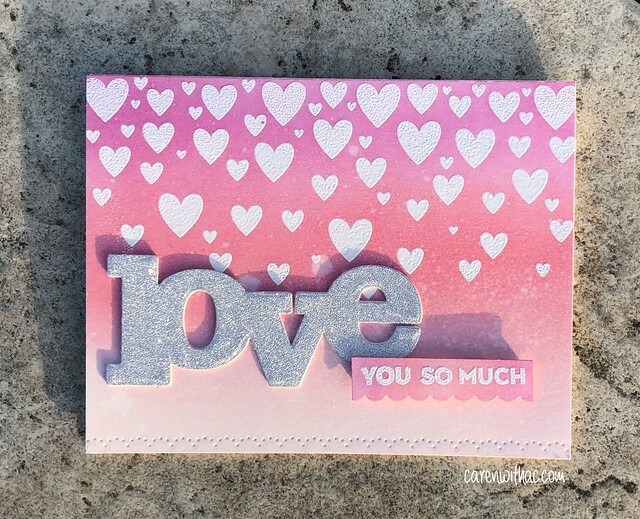 The Love card is amazing & so beautiful in pink! Thank you Greta, the ombre pink is one of my favorites to use with this technique. 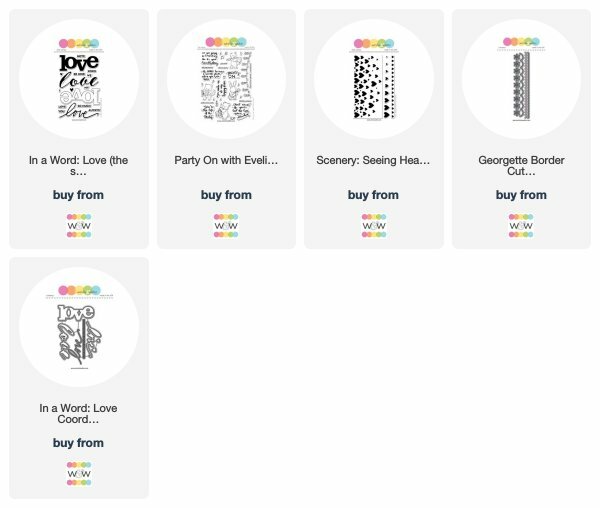 Love ….LOVE your Super Clever and Oh so Creative ideas! Caren’s cards are so beautiful and lovely !! I especially love the smooth, soft backgrounds a lot !! These are so pretty. I esp love the first one with the embossed hearts cascading down.